Is the Bible's version of Israel's history a fictionalized account? 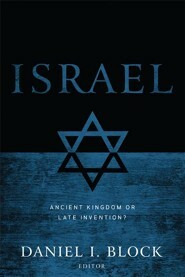 Through a collection of essays by leading scholars, this volume responds to radical claims about Israel's background. Learn more about the historicity of the Old Testament from research in extra biblical evidence and case studies from respected scholars such as editor Daniel I. Block, James K. Hoffmeier, Alan R. Millard, John M. Monsoon, John H. Walton and eight others. These scholars situate Old Testament texts in their historical and cultural contexts, opening new doors into understanding Scripture and the true history of Israel. I grew up in a poor family in the prairies of Saskatchewan, the ninth of fifteen children. I have been teaching Old Testament in Colleges and Seminaries for the past 35 years. 2. What compelled you to write a book on this subject? As the organizer of a conference on the Bible and Archaeology at Southern Seminary that featured a dozen world class evangelical scholars, we were convinced the quality of the papers presented needed to be made available to the public. Far from negating the trustworthiness of the Old Testament, archaeological and historical discoveries of the past century have provided invaluable aid in interpreting the Old Testament within the cultural context from which it emerges. Without access to the world of ancient Israel, we often misunderstand both the nature of the Scriptures and the intended message of its authors. 4. Are there some specific lessons you hope readers will learn and apply to their lives after reading your book? The Scriptures are indeed a reliable source for understanding the world of ancient Israel, and the importance of understanding that world when we are studying biblical texts. Each of the essays seeks to provide specific background information for interpreting books that deal with different periods of Israel's history. All are helpful. All the contributors share two qualities: (1) they are world class scholars in their areas of expertise (2) they are thoroughly evangelical in their approach to the Scriptures. Although my primary focus of study has always been the texts of Scripture themselves, this book reinforces and adds to the background knowledge I need to interpret the Old Testament. Do you have a favorite Scripture verse? What is it and why is it important to you? Ezra 7:10 has been the motto for my ministry. My desire is to be a scholar and minister in the tradition of Ezra, who set his heart to study the Torah intensely, to apply the teachings of the Torah to his own life, and to teach it to the people as the living word of God. The biblical prophet Ezekiel has probably influenced me more than any other, because of his clear understanding of his audience, his creativity in communicating his message, and his passion for the glory of God. Of modern authors, my mentor Alan Millard has probably influenced me the most. In his writing he combines rigorous research with a gentleness of style that is always modest and respectful, especially when responding to scholars with whom he disagrees. Our roots are Dutch, so we enjoy gardening. 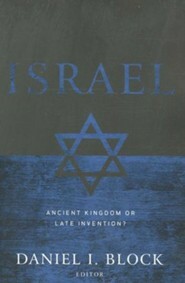 I'm the author/artist and I want to review Israel: Ancient Kingdom or Late Invention? - eBook.